"Fruit of the Spirit" Designer Blog Hop! If you got here from Diana's Blog you are in the right place! If not, please start at Layers of Color blog. We are featuring cards using their sketch and the Layers of Color Prize! Join the challenge at 2Sketches4You to be eligible to WIN THIS PRIZE: Fruitful Harvest art stamp set, Belle Brocade art stencil and Botanical Swirls art stencil! The Theme for our Hop is "Fruit of the Spirit". I stamped the image with Memento Ink and colored with Copics, then added 3D Crystal Lacquer (Sakura) to add dimension and shine. The papers are Websters Pages (WonderFall) and Pink Paisley 365*. I pleated some thin ribbon and added that. I also used 2 Martha Stewart edge punches on Gina K Pure Luxury Ivory card stock in an effort to pick up the detail in the small white pattern at the bottom of the Websters Page. My red panel is stenciled with the Layers of Color Belle Brocade art stencil using Color Box Alabaster Chalk Ink on Pink Paisley dp. The little doily was a thrift store find. The term "fruit of the spirit" basically sums up the attributes of a true christian! How can you possibly pick one favorite "fruit" to focus on, when all are important? I picked JOY for this project... did you see it over on the left side of the Websters Page? Neh. 8:10 says "The JOY of the Lord is your strength". If we know the Lord as our personal Savior, and we're walking with Him, our hearts are filled with JOY! There is a big difference between joy and happiness! Happiness can be influenced by circumstances around us. JOY is NOT dependent on our circumstances! It rises up and overflows even in the midst of sorrows. It is rooted in knowing our Savior loves us, died for us, rose again for us, and is even now preparing a place for us if we know Him personally! It comes from knowing our future is secure and God's promises are true, and we can trust Him for He has plans for us, and they are plans for our good! Now when we stray, ... our joy can be effected, as we are out of fellowship with the source of our JOY. After David's sin and subsequent agony, he cried out to the Lord "Restore to me the joy of your salvation and grant me a willing spirit, to sustain me. "(PS 51:12) We all long for JOY... and I have good news! It's one of MANY gifts given to you when you accept Christ as your personal Savior! I hope YOU know that kind of JOY today! Be sure to visit each designer’s blog as there are GIVEAWAYS on each blog!! Simply leave a comment on my blog today and I will announce the random winner tomorrow! I have chosen Touch of Elegance art stamp set for my drawing! 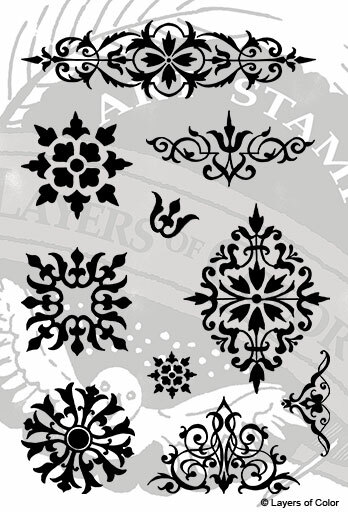 If you'd like to see what I recently made with this set scroll down 2 posts to the ornaments! Now, for more inspiration, hop to Jennie's Blog ! You’re invited to come back to the designer blogs all week as we continue to share our “Fruit of the Spirit” themed creations! Remember to subscribe to the Layers of Color blog for Faith Art Friday, Guest Designer Wednesday, tutorials, exciting upcoming news, and unique colorful ideas! May God bless you with layers of color! Other Lovlies - all about the letter J = JOY! Love this card but especially the words that you have included to explain your thought that went into creating this card. Thanks for reminding me of my source of joy. I too love the song that is playing. TFS such a beautiful card and playing with us at Stamp, Scrap, and Doodle Saturdays. Also, thanks for the chance to win. Grace, love the details you put into your wonderful card. Maybe I'll have to break open my 3D Crystal Lacquer - thanks for the reminder! LOL! Absolutely gorgeous Grace!!! Love the WP and your stenciling, the image is just beautiful. The difference between happiness and joy is so true and such a blessing to us as believers in that we can have true joy regardless of the circumstances. Blessings to you dear friend! This card just reaches towards the heavens and shouts JOY. The bold colors of the fruit is wonderful and rich . I love your pleated ribbon treatment, it adds such beautiful interest to this card. Gorgeous card, Grace! The crystal laquer is amazing on that fruit! Makes it look real enough to eat :) Thanks for sharing! Grace, I love the dimension that you achieved on the fruit. I bet that was hard to photo. Thanks for sharing what the Holy Spirit layed on your heart about Joy. What a great reminder to have that fruit in my life today! Praying for a Joy"Full" day for you my friend! Grace this is wonderful, LOVE your colors, that image, and your ribbon!!! What a SWEET creation! Your card is luscious! Love the crystal laquer, makes it look good enough to eat! Grace - another lovely creation. The glaze on the fruits are a wonderful touch and I love the lace doily you added. Your card is absolutely gorgeous, Grace! A truly "joy"ful creation! I love the beautiful papers, pleated ribbon and punched elements! It was wonderful to see you on Saturday! Hugs! Oh WOW! This is GORGEOUS! The shine on the fruit is amazing! Awesome project!! Thank you so much for sharing your Punchy Love with us at StampInsanity! Your card is lovely..the fruit looks real. Thankyou for the inspiration. So pretty, Grace! Love your wonderful coloring and the way you glazed the image! Wonderful ribbon treatment! Beautifully done! Beautiful colors, layering and details. This card definately captures the feeling of joyful exuberance. Beautiful , looks like a window! Grace your card is beautiful! Love the bright colors! The ribbon treatment is really neat!! Beautiful card! I love all the little details, especially the pleated ribbon. Fresh and joyful as a bowl of fresh fruit! 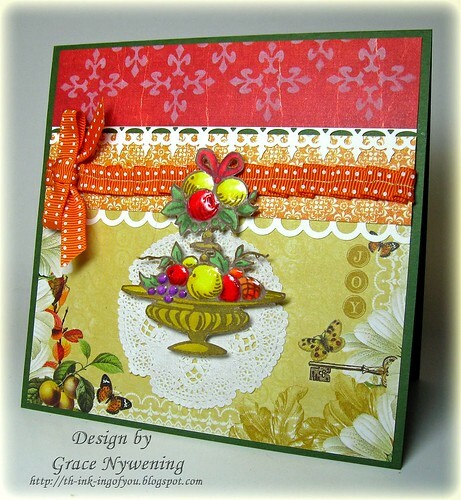 Wonderful cheerful colors and details in beautiful "Grace-ful" style! I love the colors you picked for your card! 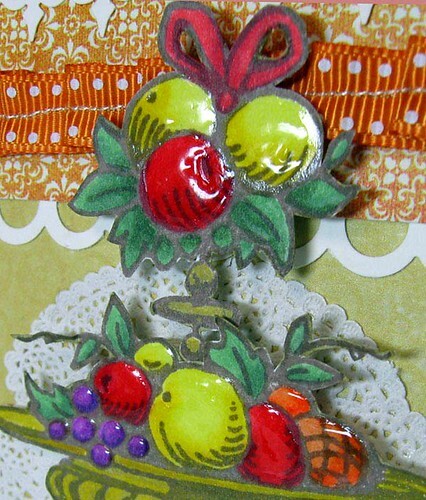 Beautiful card--I like the stenciled background and the crystal lacquer on the fruit. So much detail in your card -- it's stunning. Always love Layers of Color's blog hops and you have chosen a wonderful set to give away -- I'd love to be the winner! oh Grace... this is breathtakingly beautiful! I love the detail & the thought that went into each element. Grace this is beautiful - love the dimension and shine you have given the fruit. Excellent cardThanks for playing along with other lovelies thoughtful thursdays challenge! for the season! Another great card Grace, I especially like the shine on the fruit. Thank you for sharing your thoughts with us! What a lovely card! I love the what you added to the fruit...such a nice touch! Thanks for entering your card this week at SSDS! Thanks for the opportunity to win that pretty stamp set. Your blog is so inspiring and LOVE the music. I will be back over and over again to visit your blog. Thx for a chance to win. Beautiful card! Love your blog and the music playing; very inspirational. Fab card, love the colours & the image looks fab! Thank you for joining us at CES Challenge & Craft Your Passion this week! Good Luck & hope to see you again! Oh how pretty Grace!! I love your coloring and embossing of the fruit!! The ruffled ribbon and paper is perfect. Beautiful GF! fabulous card thanks for joining our orange challenge at SAM. great card! I love the shiny fruit! Thanks for sharing your Punch Love with us at StampInsanity!! This is such a beautiful card with lots of wonderful details! Thanks for joining us on PaperPlay this week! Gorgeous card & the image is perfect. Grace this is just gorgeous!!! Love the shine on the fruit!!! Gorgeous card! Love the way you did the fruits! Thank you for sharing your creation with us at Craft Your Passion, in our Double Anything challenge. Very colorful card and love all the detail. Thanks for joining us at SSDS.